People in general were less than thrilled about Michigan's new-look white jerseys for football. I suspect the reaction to the new hockey jerseys will be much, much better. The Hoover Street Rag found an ad for them in the new MDen catalog. That white sweater is absolutely amazing. It gets points right off the bat for having a tie. The striping is very old-time hockey. (See the Hoover Street Rag link for a picture of Red wearing a similar jersey back in his day.) The collar is only one color. To fit with the old-time feel, it's the only one of the three that doesn't have patches on the shoulders. It's a nice, classic look which we haven't really seen in awhile (even the similar pattern on our blues a few years back had those god-awful pit stains). Unless I'm mistaken, this is the first deviation from the standard white-jersey-blue-M in a long time. I think we've had that style (plus or minus pit stains) every year since I've been closely following the program (2000-01). It's a really nice change, even if I do like the old style as well. I also like the addition of the CCHA logo to each jersey. They may have offered that on the recent replicas; it's been a few years since I've bought one. But I like it anyway. I also like that Adidas got the lettering correct on the maize jerseys. The Nike lettering was way too small. I wish the blue and maize jerseys had ties, but apart from that, I think Adidas has done a really nice job. 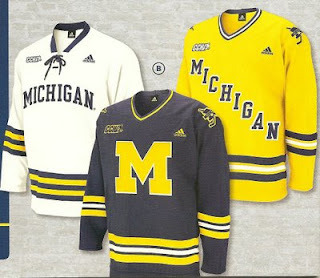 I'll be purchasing all three of them since, amazingly, I don't have a blue jersey with a maize M. But yeah, that white jersey is absolutely fantastic. I think that one has a good chance to become my #1, since my current favorite (the 98-style gold dazzle one) has proven to be horribly unlucky (at least at the Frozen Four). Agreed on the white, that is fantastic. And a note on the previous white-jersey-blue-M look, it goes back to at least the early 1990's in some form or another (used to have blue shoulders back then). But all 3 are really superb, nice job Adidas. i concur, brad. the white home unis have been block M since at least then, and i would guess since the early 70s or so (based on my recollection of team photos). at some point (2002? ), they went w/ the block M for all 3 colors (i didn't like that). the diagonal wasn't my preference, but it has grown on me. also, if it were my decision, i'd go w/ the block M for white and the arching michigan on the blue (or the arching michigan on both/all 3). the blue arching michigan away jerseys from the early 90s were the best, imo. almost all blue, save the arching michigan a few maize stripes, and the wings on the helmet. beautiful. Now THAT is a jersey! I'm buying one of the white ones. Period. Red wore that white jersey in the 60's, or very similar. A True Blue Classic.